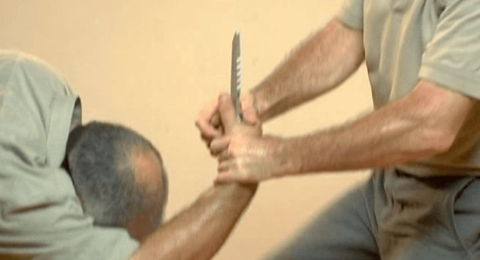 Defending against an overhand knife attack. From a short distance, meaning attacker can reach you with a short step, he tries to drive the knife into your upper part of the body, the area of the upper chest, the neck, maybe even the face. Strong defense with counterattacks, and neutralizing the ability of the attacker to repeat his attacks, by hooking on his forearm. Defenders advancing diagonally forward, stretching the opponent’s chest and shoulder muscles, make it harder for multiple stabs. Advancing diagonally forward brings your attacking hand, your attacking shoulder, in front of the target, in front of the opponent’s face. Your forearm defense pushes the attacking forearm backwards. The defense is being done with the middle are between your pinky joint and your elbow joint, impacting the area of the attacker’s wrist. With the defense itself, there’s a hook formed around the opponent’s forearm and wrist area. After several counterattacks, move the thumb to grab the opponent’s lower part of forearm near the area of the wrist. Push his arm backwards. This is a better control than before. Make it harder for the opponent to do more attacks. Counterattack is needed, and then distance yourself from the opponent. 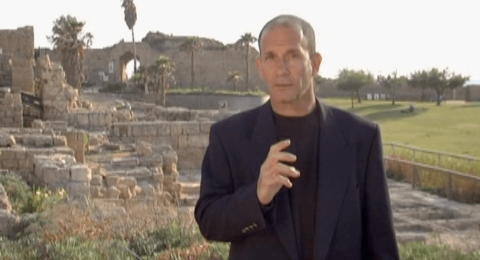 Either you move back, or because of your attacks, the attacker is moving backwards. Here comes the section of the finishing mode. One option of course, is moving away — we’ve done this before — or disarm the opponent. To disarm the opponent, circle his arm until his fist comes between you too. Your other hand with the palm, grabs and presses the fist and the back of the hand of the opponent, then strongly his wrist to weaken the grab of his knife. Then relax the grip of the upper hand, your right hand. Insert your fingers into the hand of the opponent, grab the knife, and scrape it away. Watch the blade is directed outward, not towards you. Your defensive technique, your counterattacks, your moving forward, everything should be done very aggressively, abruptly, with a lot of energy, with explosive power. You have to prevent the attacker from reaching you, or from re-stabbing you. The attacker stabs from the side. With his right hand, he tries to stab you from your left side. He’s aiming the knife towards the upper part of the body; the neck, the trapezius area, the upper chest. As you defend and turn, counterattack with the back hand. As soon as possible, you are shifting your weight towards the opponent, intercepting the attacking hand. 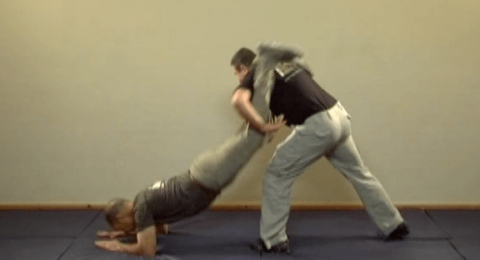 As soon as possible away from your body, the same forearm defense as was done before, which [inaudible 00:03:24] the forearm defense is not going to the side or outward, but forward towards the opponent, over his shoulder area. Press advance towards the opponent. Counterattack decisively, as soon as you can. Practically the hand defense and the counterattack with a small advance towards the opponent, always being done at the same time. The hook with the wrist and the palm, the control technique, the disarming process, always done as in the previous technique. Be sure that your actions are synchronized in a way that the counterattack is reaching the opponent at the same time, or just a fraction of a second after you did a defense. Do not delay your counterattack. Try to meet the opponent’s attack while you advance to him with a chest towards him. This will create much of a stronger impact for your technique. 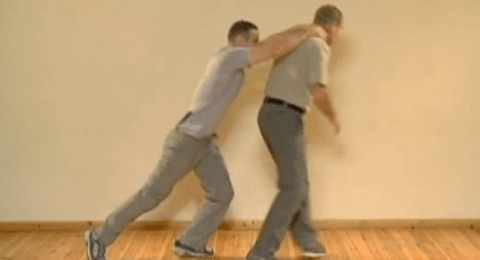 Defending the overhand knife attack when moving a bit away and counterattacking with a leg. The attacker is stabbing you either from your left or your right sides, either with his left or right hand. Doesn’t matter. This attack is more surprising. In this case, you need a bit more time, a bit more distance, in order to function, in order to be successful with defenses and counterattacks. The solution will be strong hand defense, moving the body, tilting the body away from the opponent, retreating away from the opponent with a small step, and counterattack first with a sidekick. The first appropriate sidekick can be a strong kick to the knee of the opponent. If you’re flexible, it can be towards the lower ribs of the opponent. Kicking the opponent’s knee should lower your hips, and bend the knee of the base leg. 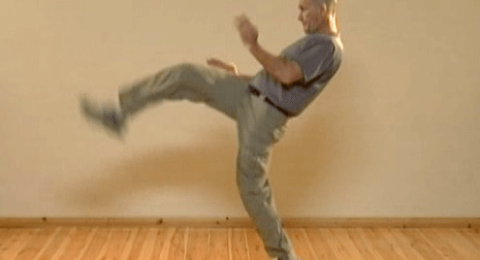 Like this, the kick will meet its target, the knee of the opponent, more or less than 90 degrees. How much to retreat from the opponent, naturally depends on the attacker’s advance, the length of the limbs. After the initial strong sidekick, continue with more attacks. It can be staying with the sideways to the opponent, and then moving away from him, or it can be turning towards the opponent. Usually we recommend to continue with kicks, keeping yourself away from the opponent. 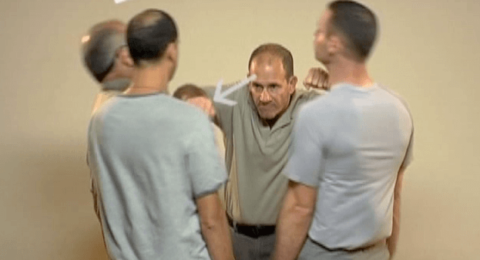 As you surely understand, the hand defense is as executed before, however, there’s no control over the opponent’s hand, and the hand defense is being enhanced by a strong body defense, tilting away from the danger zone. The counterattack is done rather simultaneously with the tilt of the body away from the danger zone. Defending an overhand knife stab. This time the attacker is right-handed, coming from your right side. The distance is a short one, meaning the attacker has to make a very small step in order to reach you. As was done in the frontal technique, defending and counterattacking simultaneously with an aggressive technique, here we are doing a parallel attitude, meaning defending and counterattacking and advancing towards the opponent as soon as possible. Turning to the opponent will not enable you to strike him with your back hand, this time the left hand. The idea is to advance towards the opponent with strong defenses, and the first counterattack with be with the leg, with the knee, which is the closest to him. 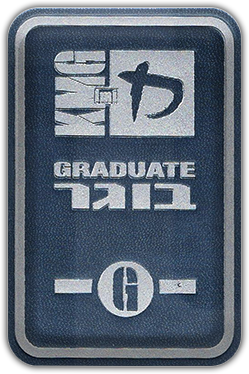 The action is combined from hand defense, with a closed hand, sending your weight, advancing with the back leg of it, turning towards the opponent, and striking first of all with a closed knee, with the right knee. At the same time, the back hand neutralizes the ability of the opponent to stab again. It is with the forearm reached towards the forearm of the opponent, with the hook. Grab his forearm, and turn the body, and continue with the body defense to move away from the channel, and naturally from the line of the attack. Grabbing the forearm of the attacking hand should be as soon as possible. Your far leg is advancing diagonally forward, to enable the initial knee kick. Then continue to move out from the danger zone. Get out from the channel. Continue to control the opponent’s arm with your left hand, while counterattacking with your back hand, with your right hand. This is the hand that was initially defending. In this technique as well, one should be careful from removing the hand defenses, meaning send your hand defense, send your forearm defense to meet the attack as soon as possible, and press with your forearms towards the area that the attack is recording to. After advancing towards the opponent, then you get out from the danger zone. Then you get out from the channel of the attack. From a medium distance, the attacker advances with another large step, and tries to stab towards the upper part, the neck, the head, the trapezius area. As this is a medium distance, we have enough time to try to get out from the channel of the attack as soon as possible. 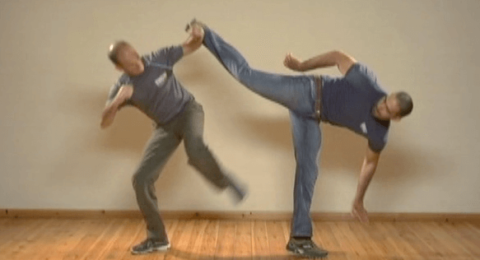 In this case, as you execute the hand defense, the close leg is moving diagonally forward and turning. The foot turns, landing with the toes towards the opponent. At the same time, the body is turning towards the opponent. 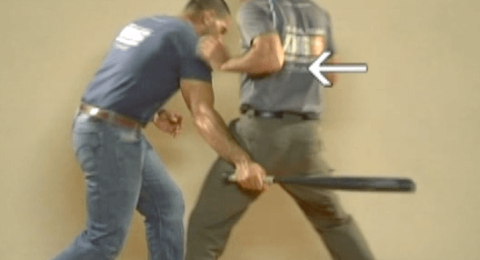 This brings the back hand to the position that it is able either to counterattack, but in most cases, just to grab and neutralize the attacker’s hand. As the stabbing hand is being grabbed, the defending hand can do now strong counterattacks, while the whole body already moved out from the channel. 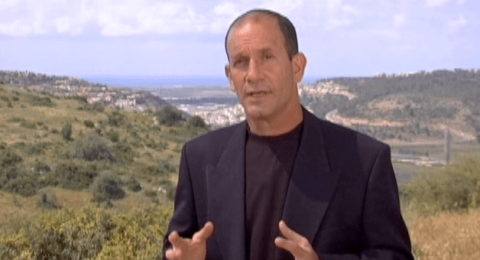 In all these cases, we either move away of the defending and counterattacking, or we neutralizes the attacker’s ability to resist, and disarm him, then move away from the danger zone. In this technique, it is important to move away from the channel of the attack, the line of the attack, as soon as possible. This is being done by the step diagonally forward, with the whole turn of the foot, and whole turn of the body. The moment you lift it, the leg which is closer to the opponent is moving towards him. So your back leg, your far leg in this case, the left leg, needs to push strongly while the body’s turning, getting out of the channel of the attack. Pay attention that your step is diagonally forward, towards the opponent’s side. The defending hand here, deflects a bit the attacking hand, however, be careful not to swing your defending arm too much to the side. This may expose you to additional knife stabs. The back hand should grab and control the attacking arm as soon as possible. The same time that you’re controlling the opponent’s arm, the far hand, the back hand now, this was a defending hand, counterattacks strongly to neutralize further resistance, and any further attacks that the opponent, the attacker, tries to do. The controlling hand is moving with some sort of an inside defense, and using the hook of the wrist, and the grab of the palm, to neutralize the opponent’s ability to move when he’s attacking.